I have been a huge fan of using low calorie almond milk as a healthy alternative to cow’s milk for a *long* time. I think that almond milk tastes great as a drink on its own (particularly when I’m bored with water), or it works wonderfully in low calorie smoothie recipes or even on breakfast cereal. 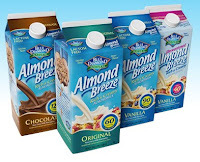 So I was very intrigued when I recently discovered a newer, delicious-looking refrigerated version of Almond Breeze near the milk cartons at my local Whole foods. Refrigerated almond breeze comes in 4 flavors: Chocolate, Vanilla, Original, and Unsweetened vanilla which range from 40-120 calories per cup. My local Whole Foods carries the Original flavor (at 60 calories, and still only 1 weight watchers point! ), so I now drink that rather than the 40 calorie unsweetened vanilla flavor of almond milk that used to be my staple. I think the refrigerated original Almond Breeze tastes really fresh, sweet and wonderful. It is also convenient in that it is cold and ready to use right when you bring it home from the grocery store. This is especially useful if you want to drink some right away or use it on cereal (like the yummy low calorie Organic Krispy Brown Rice cereal). If you cannot find the refrigerated or non-refrigerated Almond Breeze at your local store, you might want to look for the low calorie Pacific Almond Milk. All the almond milks are soy-free, lactose-free, and high in Vitamin E.
I am so glad that your back! I just recently found your blog when doing a search for healthy diet foods. It is such a good resource! I can't wait to see what new things you come up with. I've been using this for a few months (as a less controversial alternative to soy milk) and think it's great!